Saturdays, Mondays and Wednesdays; and Asian Classics on Fridays. Barrio Fiesta is a feast of well-loved homegrown favorites highlighting the famous Cebu Lechon. There are also stations including the Adobo Connection, which is a variation of the Filipino dish and the Binalot Station, which offers toppings wrapped in banana leaves. Other signature dishes include Pusô’s salted egg ensalada, Cebuano callos and seafood inun-unan. For a sweet finish, native Filipino delicacies abound at the dessert station. globe such as meat carvings, paella, pizza and pasta. There is a rotating selection of international dessert treats as well. Lastly, Asian Classics is the chefs’ ode to Asia’s culinary heritage and rich array of spices. It highlights the region’s culinary masterpieces such as Chinese dim sum and noodles, Korean-style barbecue, grilled saté, sushi, rendang, a fried rice corner and more. For dessert, there are variety of flavors of tikoy or rice cake. 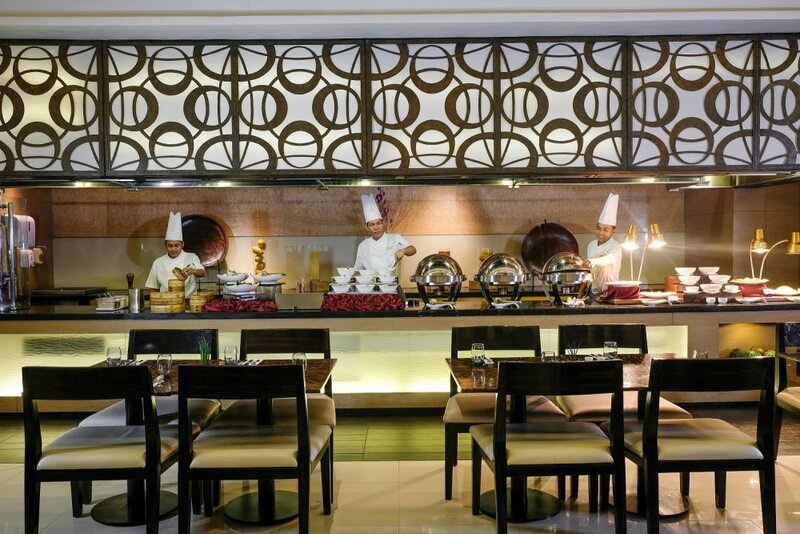 Indulge your palate and head off to Pusô Bistro & Bar from 6 p.m. to 10 p.m. Buffet price is at PHP850 net per person.